I feel like I have been neglecting this little blog. School has been crazy- I am in the middle of an oral advocacy competition and I have to make new arguments and go head to head each week in addition to class, reading, writing an appellate brief for moot court and working in admissions. Blogging just got pushed down the priority list. But I am back! Now on to today's topic... as I am a few weeks into 2L year, I have made some adjustments to my study habits. Some of my upper-level courses are structured a little differently than my 1L core classes which have forced me to adjust as well as my own shifting and evolving learning process and knowledge base. I have posts from 1L year about my note-taking and study habits and I do believe that they served me very well at that time and for those classes. The adjustments I have made are more due to changing class structures and my ever-evolving way to understand the law as best I can and as thoroughly as I can... and I have become busier so efficiency is my #1 priority now. Here are the changes to my law school study habits. Unlike many of my classmates, I continue to read everything for class and take notes on my reading. Many of my classmates have dropped down to just book briefing but I find that taking notes is the best way for me to truly understand the material and have the best retention of it. Unlike my 1L year, I actually take more detailed notes from the reading and I count on them more in class as I participate more. 1L year I was content to answer cold calls, sit and listen and only voluntarily talk if I truly felt confident in what I had to say. Now that I am a 2L and a lot less nervous, I raise my hand whenever I have something to contribute and therefore having good reading notes helps me to follow along with class and have insightful comments. Also, my real life experience of working in a prosecutors office has given me some real-life legal context for some of the things I am learning in class. Therefore, when reading for class, I jot down notes of real-life examples that are related to bring up in class or in office hours. I find that having some real-life context is really helping my retention of the material so far this year. Additionally, my classes are structured a little different: one of my classes has little to no case law and is based on problems... Another is based purely on statutes. It has required me to read and learn differently. Another change I have made from 1L year to 2L year is I take all of my class notes by hand. I found that when I took computer notes last year, I more easily became distracted and I did not retain as much of the information. This is reasonable because many scientific studies have been done that prove handwriting aids in retention and better understanding. By hand writing my notes, I am forced to synthesize the professor's points because I cannot physically handwrite every word as easily as I could type every word. This is a constant practice in analysis, issue spotting big rules and synthesizing which are important legal skills. I find that I remember the information better and when I type it up later into an outline, I am working from my own synthesized words and rules, not the professor's words and it helps me to have a deeper understanding. I have found that simply word-vomiting the professor's words/phrases onto an outline does not equal full understanding and was not the most effective way for me to outline. I also color code all my class notes because bright colors are easier for me to remember long term and it distinguishes class info from reading notes; I take all reading notes in black ink and class notes in a color designated for that specific class (ex. Constitutional law is blue, criminal procedure is purple...). I also love the freedom handwriting notes provides- I can make graphs, pictures, tables, etc. Whatever I need to do to get that information, I can. Sometimes computers can hinder notetaking in my experience because of the formatting problems and having to pause during class notes to fix the bullets or margins, etc. I learned my lesson first semester of 1L year- outline as you go. I spent last Thanksgiving break frantically outlining and it was the worst. Now, my approach to outlining is to outline after finishing a section or chapter. This way, I am outlining throughout the semester and I can address questions, confusion or concerns sooner rather than later. It also helps that the information is fresher in my brain when I outline it and it helps me to formulate and synthesize it better into the outline thus creating a much more effective study aid come finals. I just finished the fourth week of the semester but I have all my outlines started and 2 are completely up to date...the others will be up to date by the end of this weekend. I refuse to stop making my own outlines- I think it is such a valuable skill and learning tool... simple printing another persons outline will not allow me the same level of understanding nor the learning provided during the outlining process. Overall, outlining no longer scares me the way it did 1L year... I just buckle down, set aside some time each week and get it done. Kind of like outlining, I have started reviewing throughout the semester instead of just at the end. Not only is outlining itself a form of review, I make a point to review my notes after class, twice after reading and to attend office hours. I attempt to make sure that I understand everything right away instead of waiting until the end of the semester to figure something out. There just is not enough time to do it all at the end of the semester and I need excellent grades so I am putting all the extra effort in. I have started doing some of the practice problems from the casebooks and as the semester moves on, I will be completing multiple choice questions each week and practice problems that I can take to professor office hours for feedback. This is something I neglected 1L year and I think I did myself a disservice. After reviewing my past exams, I have identified a few issues I would like to work towards resolving in the future when taking exams- I am not waiting until the end of the semester; I am starting right away to do everything in my power to be as successful as possible for exams this semester. Unlike 1L year, I know exactly what I need to do to be successful... I just have to buckle down and do it. My schedule is a little more diverse this year. I have more responsibilities beyond just reading, class, studying. One thing I haven't changed is my dependence on my planner. I would seriously go insane without it. Beyond that, I have had to be a little more inventive with my time to fit everything in. I multitask- cooking is also my Netflix time, I work in between classes to make money, I do my reading right when I get home from class so I don't procrastinate, I outline and review on Friday afternoons before 5pm so I can have Friday nights off. For my appellate brief for moot court, there is very little structure. Therefore, I set aside time each week within my planner to work on it and stay accountable. I have started to do this with everything- I plan time for cleaning, grocery shopping, outlining... everything is planned and I do my best to stick to it. I meal plan and utilize a crockpot often to make sure that we eat decently without wasting a bunch of time in the kitchen puttering around or doing the "what sounds good" or "what do we have" discussion. I record my oral advocacy competition arguments and listen to them while driving to and from class to enforce my memorization of my arguments. 2L year for me is all about efficiently and effectively using my time so I can get everything done and still have some time to relax. For me, 2L year has been about implementing the lessons I learned 1L year and making myself a better student and a more efficient person. I do not regret the things I did 1L year... I was not the same person I am now and I am choosing to move forward to be the best I can be. 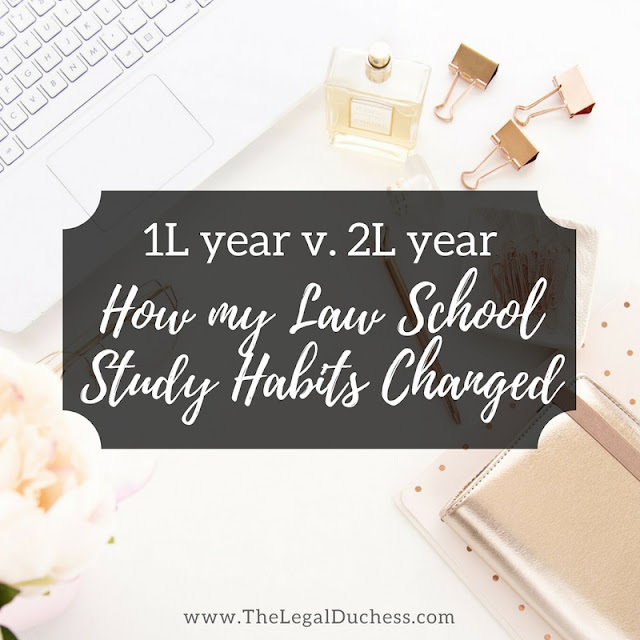 2L year is definitely different and is stressful and difficult in different ways than 1L year. However, I am confident that I will be successful and I am more confident than ever that the law is what I want to do.